Well it’s happened again. We have left civilization behind and once again found ourselves a gorgeous patch of desert to call home. One that we have no intention of leaving anytime soon. As much as we enjoyed exploring San Diego, there’s something about the city that makes it hard to relax. Maybe because we felt the need to see as much as possible in the time we were there. Or maybe because living in the middle of a city reminds us of all the errands we need to take care of…which means lots of visits to stores, waiting in traffic, and squeezing into tiny parking spaces. And while shopping, eating out, people watching and sightseeing can be fun, after a while it just makes you wish for a quite place to soak up some nature. Which is exactly what we have found out here in Borrego Springs. 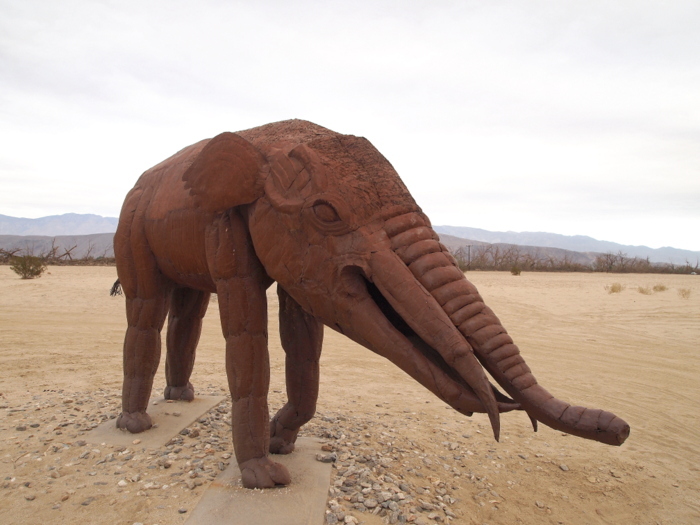 Borrego Springs lies roughly two hours north-east of San Diego. 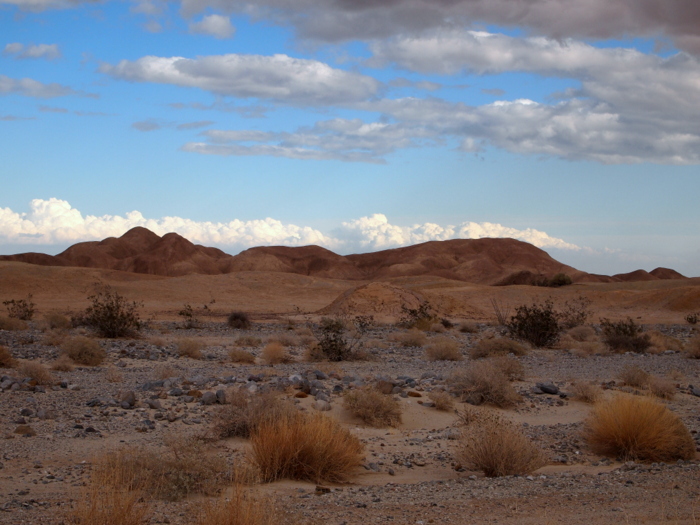 It is a unique desert community surrounded on all sides by California’s biggest state park, Anza-Borrego Desert State Park. The park encompasses 600,000 acres of land, making it a fantastic place to explore all that the Colorado Desert has to offer. With 110 miles of hiking trails and 500 miles of dirt roads you could spend months here without visiting all of the park. There are variety of camping options in and around the park including four developed campgrounds and numerous free primitive campgrounds. 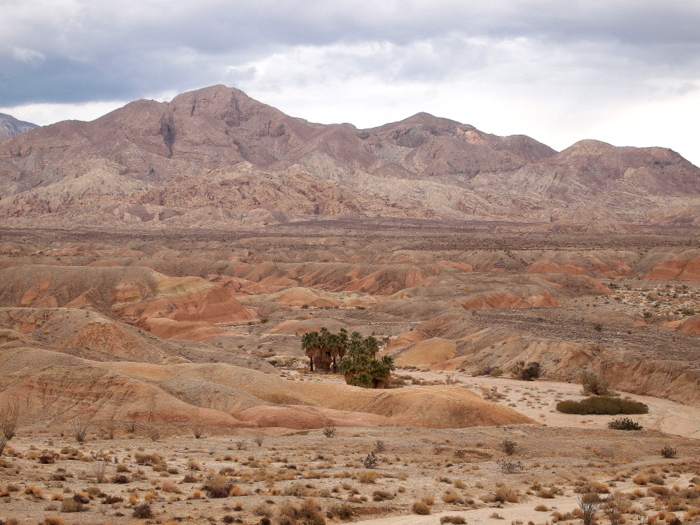 Anza-Borrego is also California’s only State Park to allow dispersed camping. Meaning that you can basically camp anywhere within the park for free provided you are a certain distance from water sources and no more than one car length away from a road. Sounds good, except finding a suitable spot with an RV can be difficult, not to mention that the park is severely lacking in cell phone service which makes work and regular life pretty much impossible. Lucky for us (and thousands of other RVrs who visit every year) there is another free option for RV camping in the area. 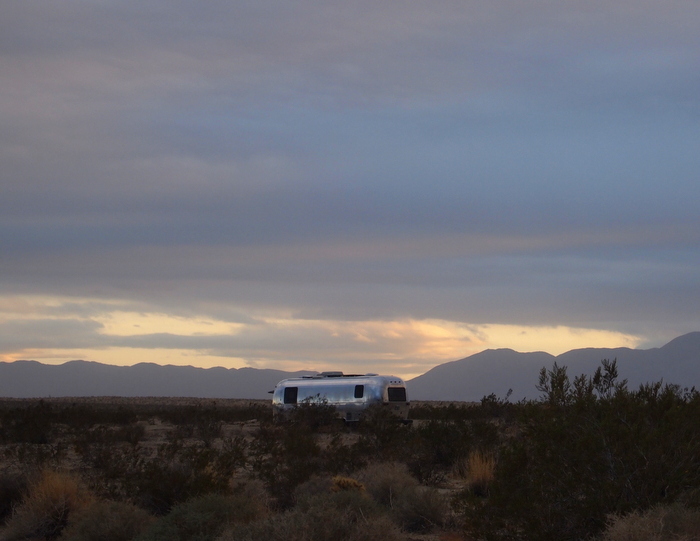 Just east of town is a privately owned chunk of land near the Clark Dry Lake that is open and free for campers. It’s a pretty well known spot with lots of easy access camping spots. There are a few congested areas with rigs parked close together, but also tons of wide open space where you can easily claim your own piece of desert. We found a spot away from the large groups of RVs, with just a few other rigs in sight. The Verizon signal fades pretty fast as you get farther from the main rd which prevented us from seeking out a completely secluded spot. 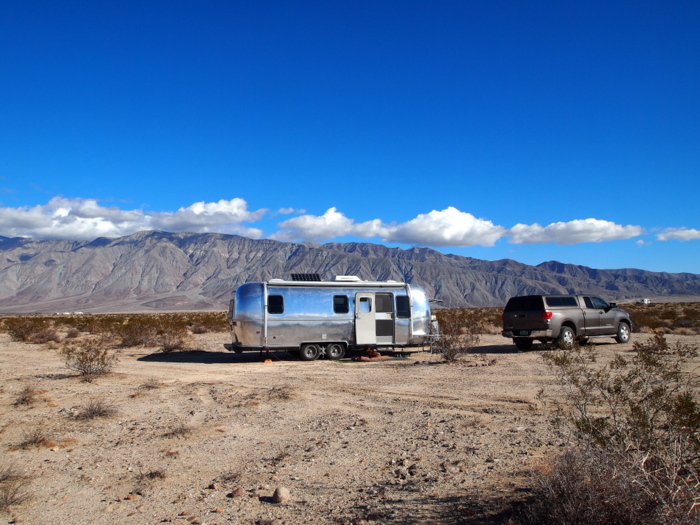 A few nearby RVs are no big deal though when we are surrounded by stunning mountain views and a wide open expanse of desert sky. You can check out our exact location on the map here. We’ve only been here a few days, but already we’ve explored around quite a bit. 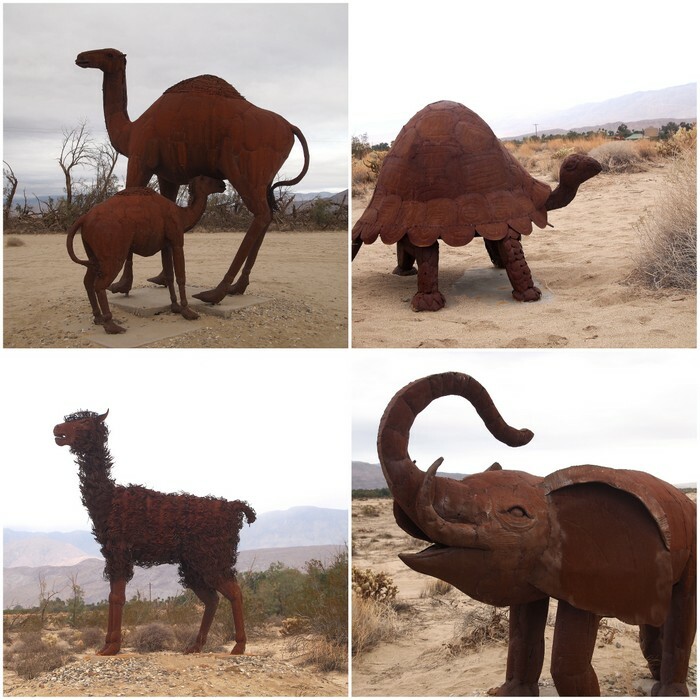 Our first adventure was to see the metal animal sculptures at Galleta Meadows back in town. Look! Someone made a sculpture of Phineas! 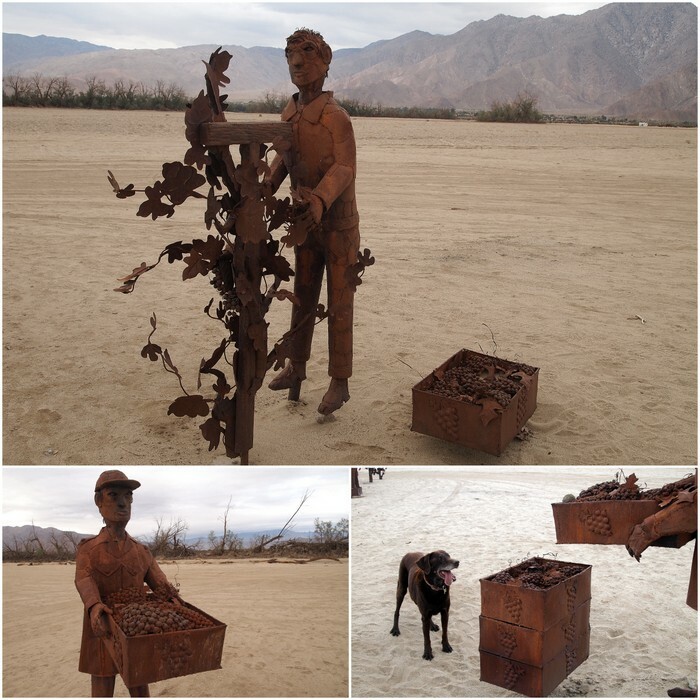 This incredible open air art display was the vision of Galleta Meadows owner Dennis Avery. 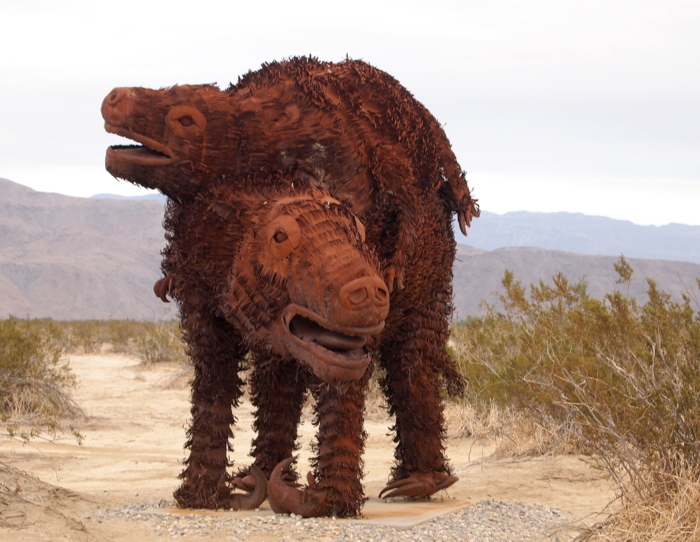 After spotting a 20-foot Tyrannosaurus Rex on the side of the highway built by Richard Breceda, Avery was inspired to create a roadside “sky art” exhibit containing replicas of the animals who once roamed the Borrego Valley. 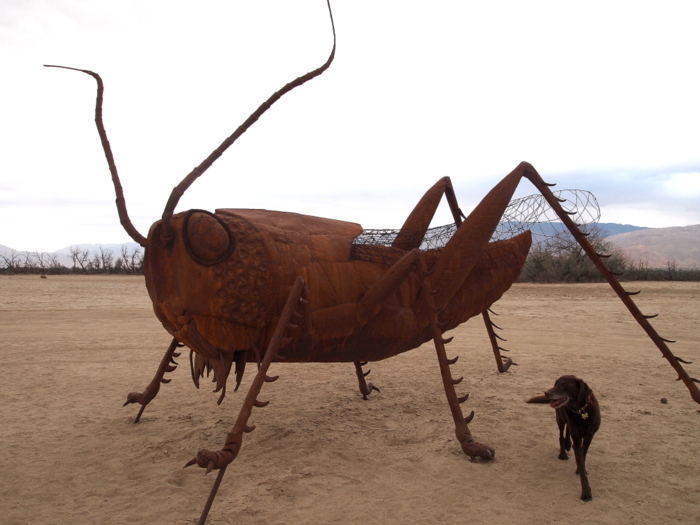 Avery commissioned Breceda to build the animals and much to the delight of tourists and locals alike they began appearing around town in 2008. The first was a pair of prehistoric elephant-like mammals called Gomphotheres that roamed the area 4 million years ago. Today the collection has grown to 129 animals scattered along Borrego Springs Rd just north and south of the town center. The sky was darkening steadily during our visit so we didn’t see all of the animals, but we’ll definitely go back again to view the ones we missed. Our second day of exploration took us not in search of animals, but instead for a Palm Tree Oasis in the desert. Seventeen Palms to be exact. 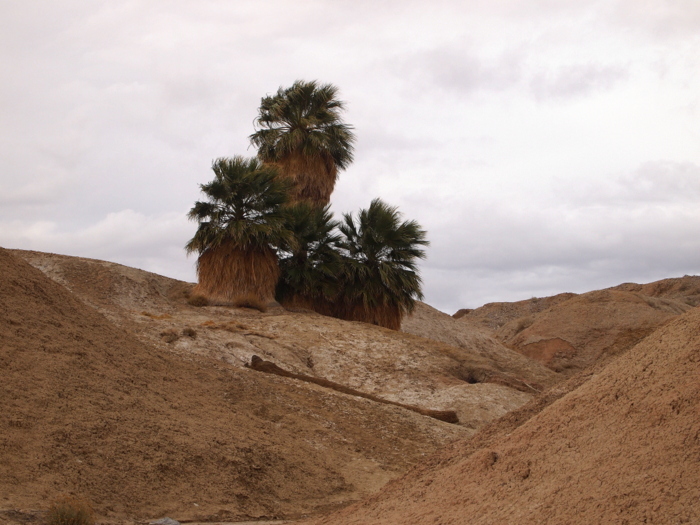 Anza-Borrego has a few of these Palm Oases spread throughout the park where natural springs and the state’s only native palm, the California Fan Palm (Washingtonia filifera) can be found. The trail to 17 Palms Oasis and 5 Palm Oasis is located off Route S22 past the Arroyo Salado primitive camping area. 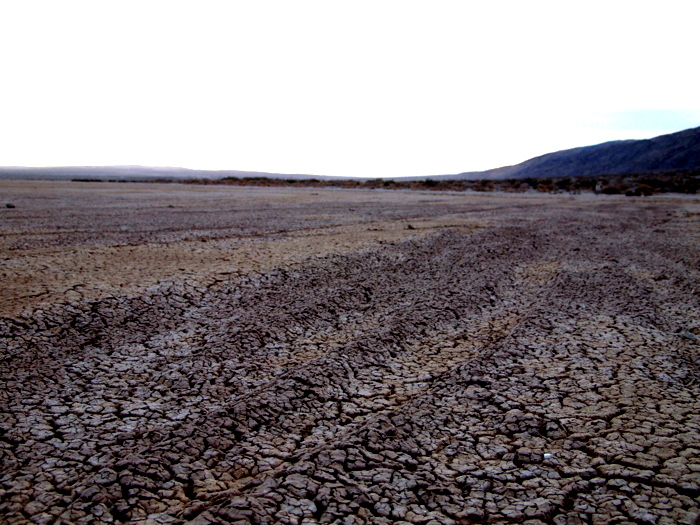 You can walk or drive the 3.5 mile Arroyo Salado wash to the first oasis. We wanted Phineas to come along for the journey and knew 7 miles round trip would be too long for him, so we drove to 17 Palm Oasis and from there hiked the short 1.5 miles farther to 5 Palm Oasis. 17 Palms must have been named awhile ago because we counted 24 Palms in this one grove. 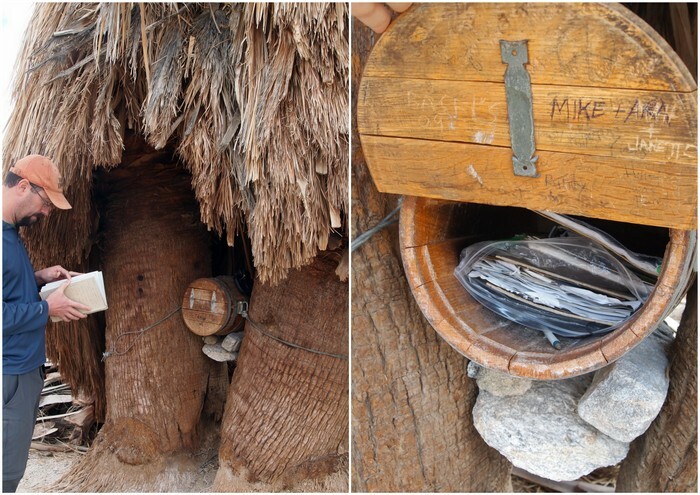 We also found a barrel shaped mail box tucked among the tree trunks full of visitor’s log books. The barrel is reminiscent of long ago when travelers stopped by this oasis in search of water. Since the spring was notoriously unreliable travelers began leaving jars of water with notes attached hidden in the shade of the palms for others to find. Today we didn’t find any water in the spring, or hidden among the palms, but we did take time to check out the notes other visitors had left behind. A short scenic walk through the desert took us to the next, smaller oasis. This one was called 5 Palm Oasis, but once again the count was off. This time it was short one palm. We did see a large, dead trunk lying on the ground nearby as evidence that this once was truly a 5 Palm Oasis. We climbed up the small hill behind the Palms and the view was astounding. 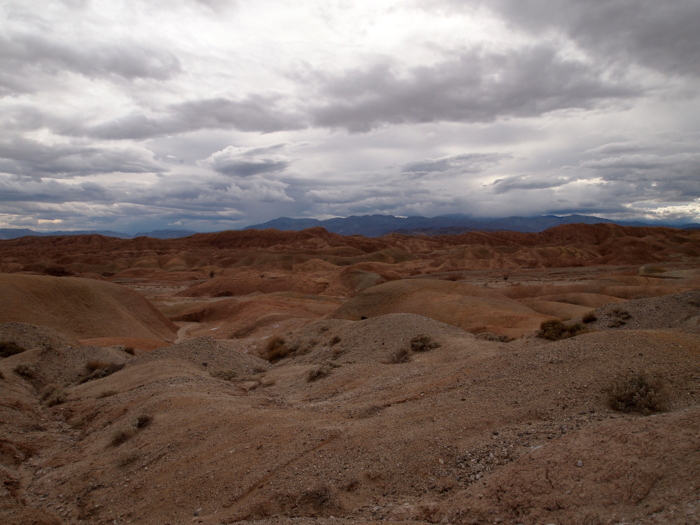 This area is referred to as the Badlands of Anza- Borrego and after visiting the Badlands of South Dakota this past summer we could definintely see the resemblance. 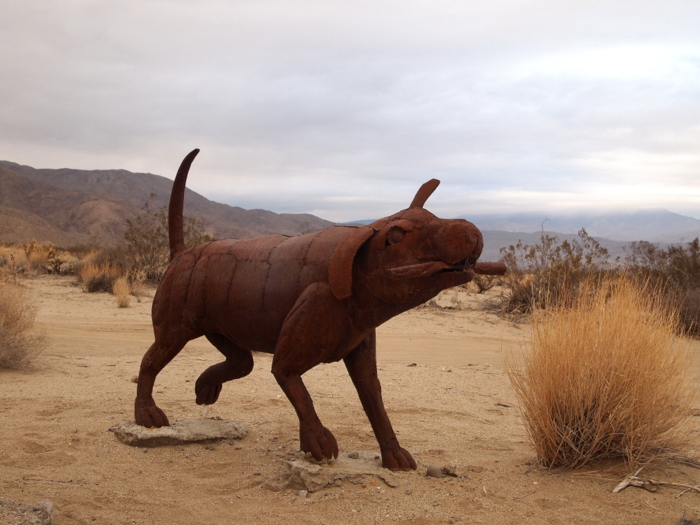 This is only our third day out here in Borrego Springs and already we’re loving the area. Can’t wait to see what the rest of our stay has in store! Ahhhhh…loving the pics. Wish we were there with you guys! We wish you were here too Nina! We had such a great time meeting you and Paul in San Diego and only hope that our paths will cross again. 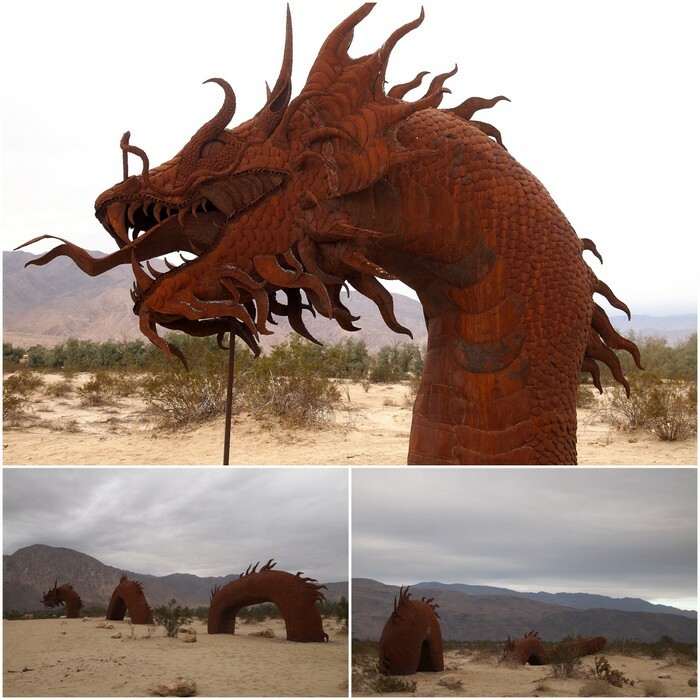 Thanks so much for all the helpful information about Borrego Springs. We can see why you love it out here so much!